Although no one knows the exact year, locals will tell you that Pacific City Hardware & Lumber has been around since the 50’s. During the 90’s there was a fire, but in 1999 Pacific City Hardware & Lumber was moved to its current site. Open seven days a week, Pacific City Hardware & Lumber carries a wide array of merchandise in their paint, electrical, plumbing, hardware, lumber, tools, lawn & garden and housewares departments. Because of coastal weather, the store stocks an abundance of pressure-treated lumber and stainless steel. Pacific City Hardware & Lumber is a True Value dealer, which allows them to take advantage of True Value’s national buying power and provide lower prices to customers. Lumber comes from three major distributors, two of which are Oregon-based. “Even if we don’t have something in stock, our True Value affiliation allows us to get it here quickly, usually within the week,” says Heath. Owners Gregg and Lisa Alves are proud to operate this long running business and to employ their hard working staff. Pacific City Hardware and Lumber has five full time employees. Those five employees keep the store open seven days a week. Schrock, who started at the store nine years ago doing accounting work, was promoted to manager last November. 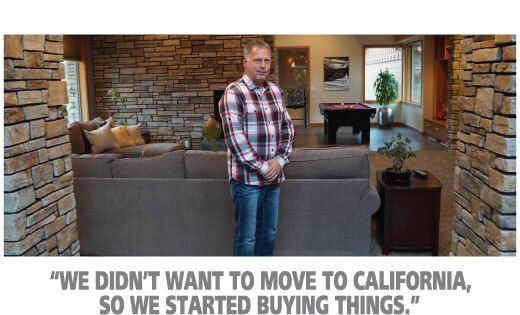 Heath also has nice things to say about Pacific City Hardware & Lumber’s bank, Oregon Coast Bank. “They always seem to be looking out for us,” Heath explains. But the relationship goes both ways. “Whether it’s re-doing a bathroom, painting a bedroom or putting in a water heater, someone at the bank always seems to be doing home repairs, which means we see them at the store as much as we see them at the bank,” laughs Heath. It’s been our experience that whether you’re fixing things, remodeling or just solving the latest plumbing emergency, Pacific City Hardware & Lumber can help. And even if you can’t describe that broken part, chances are they’ll know exactly what you need. They’re amazingly good interpreters of the language of the unknown.